I confess to being a little chagrined that – with our regular flu season essentially over – I didn’t check last week’s FluView report (week 17), else I’d have seen the following notice (h/t Camster on FluTrackers) summarizing the second swine variant (H1N1v) infection recorded for 2015 (see FluView Wk 3 for 1st report) . A bit surprisingly, it was not listed in last week’s MMWR table of Notifiable diseases (which I did check). First the report, then I’ll return with a bit more on swine variant viruses. One human infection with a novel influenza A virus was reported by the state of Ohio. The person was infected with an influenza A (H1N1) variant (H1N1v) virus and died from complications as a result of the infection. The patient worked at a livestock facility that housed swine but no direct contact with swine was reported in the week prior to illness onset. No ongoing human-to-human transmission has been identified. Early identification and investigation of human infections with novel influenza A viruses are critical in order to evaluate the extent of the outbreak and possible human-to-human transmission. Additional information on influenza in swine, variant influenza infection in humans, and strategies to interact safely with swine can be found at http://www.cdc.gov/flu/swineflu/index.htm. Over the past few years we’ve watched as several swine variant influenza viruses (H1N1v, H1N2v or H3N2v) have made tentative jumps into the human population (see Keeping Our Eyes On The Prize Pig) and each summer the CDC has issued advice on preventing infection at county and state fairs (see Measures to Minimize Influenza Transmission at Swine Exhibitions, 2014). 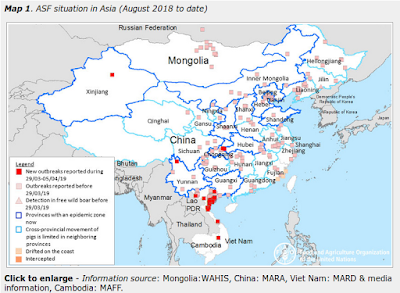 Of the 374 Swine variant infections detected over the past decade (undoubtedly an undercount given the limited testing), the the vast majority have been of the H3N2v subtype. Only 18 (5%) were H1N1v, and even less (5) were of the H1N2v variety. We’ve not seen many reported cases the past couple of years, but during the summer of 2012 more than 300 cases were detected, with Indiana and Ohio accounting for more than 3/4ths of the cases. Illnesses were usually mild or moderate ( only 1 fatality until now), and infection usually occurred in the summer and fall - associated with attendance of local and state fairs where pigs were being shown. Of course, some people have contact with swine all year round, and so while uncommon, it isn’t terribly surprising that someone would contract a swine variant virus `out of season’. These swine viruses are important because – unlike many of the avian strains – they belong to the H1, H2, and H3 HA types that have led to all of the known pandemics of the past 130 years. The progression of human influenza pandemics over the past 130 years has been a fairly unoriginal H2, H3, H1, H2, H3, H1, H1 sequence. While that doesn’t prove that an H5 or an H7 virus couldn’t adapt to humans (or hasn’t in the past), it has led some researchers to wonder whether a non H1, H2, or H3 virus has the `right stuff’ to spark a pandemic (see Are Influenza Pandemic Viruses Members Of An Exclusive Club?). So – while not all that unusual, typically poorly transmitted by humans, and generally producing only mild to moderate illness – we keep a special eye on any swine origin virus that manages to jump to humans. Two weeks ago, in Waiting For The Next Flu To Drop, we looked at some of these `novel flu contenders’, and with county and state fair season kicking off in some areas next month, I’m sure we’ll be talking about biosecurity measures both for the swine and poultry exhibits frequently over the summer.